Problematic grinding performance typically arises as a consequence of improper dressing. Choosing the correct diamond quality classifications greatly improves the expected quality of finished products. Moreover, the number of settable points will contribute heavily to acceptable dressing standards. Grade A quality diamonds provide four+ settable points--smooth-surfaced octahedron or dodecahedron. Grade B quality diamonds provides three+ settable points--possibility of inclusions, although they do not disturb the diamond's integrity. Grade C quality--two+ settable points exhibiting blockish structure with superficial irregularities. This grade is the most common grade used in tool rooms. Grade D quality--less than two settable points. Grade D's may have defects around less defined points. Grade E quality--one settable point, "utility" grade diamond typically presenting cracks and other flaws. 1. Extend the life of a single point diamond dresser by inclining the tool at a 10 to 15 degree angle to the wheel radius. Point the tool in the rotation direction of the grinding wheel to maintain a consistently sharp point. 2. When dressing with Polycrystalline (PCD), grit, diamond single points or arbitrary stone tools, the infeed has to be .001 since a diamond dressing tool inevitably pulverizes the vitrified bond. Anything higher than .001 will cause cracking into the wheel--as much as .009 deep--that forces the bond to degenerate. In addition, gullets develop that produce loading by catching chips and overheating the wheel. Consequences of excessive infeed are chatter, bounce, bad finish and burn. 3. Sharply-tipped, crystal octahedrons should be utilized for straight dressings. For 46 grit and 60 grit wheels, crystal octahedrons shaped in a gothic style work well. Points associated with crystal octahedrons stay sharp if you turn the tool six to 12 indexes every revolution, or as necessary. 4. Make sure to use enough coolant to moderate dressing temperature, otherwise overheating occurs which may chemically transforms diamond into graphite. Diamonds will also suffer cracking if subjected to large temperature gradients. 5. The objective of dressing is to generate and expose novel, superficial cutting edges on the wheel. Single point diamond dressers achieve this objective by shattering existing gravelly grains and facilitating the emergence of desired abrasive particles. Dressing increases in-feed as well as feed and must be performed regularly to maintain optimal grain protrusion and grain edge sharpness. 6. Always begin dressing at the center of the wheel, which is the biggest diameter. Starting a dressing procedure at a wheel's side will probably result in shattering or even destroying the highest quality diamonds. 7. 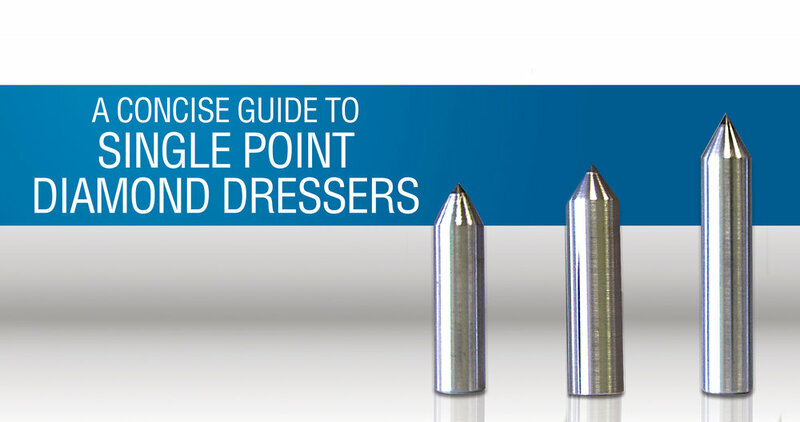 To prevent wheel taper, place the single point diamond dress as close as possible to the grinding area. 8. Grinding wheel grain sizes are contingent on longitudinal feeds, which significantly influences the structure of the surface of a grinding wheel. Additionally, reduced feed rates will predictably provide finer, more desirable surfaces. 9. Rotate the dresser 20 to 40 degrees in the shank if a flat appears on the diamond so that the dresser maintains an optimally conical point. 10. Avoid letting the diamond erode until the shank is visible. Doing so could allow the stone to dislodge or fall out.